This type of fencing can be constructed using a combination of materials to create a fence to suit your needs whether its agricultural, equestrian, domestic or commercial. Each fence can be constructed using either high tensile stock net, barbed or plain wire and rails. A maximum of 5 rails high can be attached to each section of fence. and rail fence, but more cost effective and provides a nice rustic look. A high tensile stock fence is an effective way of securing your stock and can be constructed to suit most budgets. 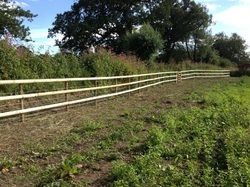 All stock fencing can be supplied and fitted to your requirements. We can supply and fit stock fencing from just £3.95 per metre, please ask for a quotation. Our digger and post driver is available for hire. Please contact us direct or see our Digger Hire page for more information. With a wide range of styles available we are able to supply and fit any fence to your requirements.